For other uses, see Man Ray (disambiguation). Man Ray's birth name was Emmanuel Radnitzky in South Philadelphia, Pennsylvania, US, in 1890. He was the eldest child of Russian Jewish immigrants Max, a tailor, and Minnie Radnitzky. He had a brother, Sam, and two sisters, Dora and Essie, the youngest born in 1897 shortly after they settled in the Williamsburg neighborhood of Brooklyn, New York. In early 1912, the Radnitzky family changed their surname to Ray. Man Ray's brother chose the surname in reaction to the ethnic discrimination and antisemitism prevalent at the time. Emmanuel, who was called "Manny" as a nickname, changed his first name to Man and gradually began to use Man Ray as his name. Mason Klein, curator of a Man Ray exhibition at the Jewish Museum in New York, Alias Man Ray: The Art of Reinvention, suggests that the artist may have been "the first Jewish avant-garde artist." 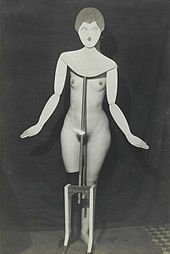 Man Ray was the uncle of the photographer Naomi Savage, who learned some of his techniques and incorporated them into her own work. Man Ray, 1919, Seguidilla, airbrushed gouache, pen & ink, pencil, and colored pencil on paperboard, 55.8 × 70.6 cm, Hirshhorn Museum and Sculpture Garden, Smithsonian Institution, Washington, D.C.
Man Ray displayed artistic and mechanical abilities during childhood. His education at Brooklyn's Boys' High School from 1904 to 1909 provided him with solid grounding in drafting and other basic art techniques. While he attended school, he educated himself with frequent visits to the local art museums, where he studied the works of the Old Masters. After his graduation, Ray was offered a scholarship to study architecture but chose to pursue a career as an artist. Man Ray's parents were disappointed by their son's decision to pursue art, but they agreed to rearrange the family's modest living quarters so that Ray's room could be his studio. The artist remained in the family home over the next four years. During this time, he worked steadily towards becoming a professional painter. Man Ray earned money as a commercial artist and was a technical illustrator at several Manhattan companies. The surviving examples of his work from this period indicate that he attempted mostly paintings and drawings in 19th-century styles. He was already an avid admirer of contemporary avant-garde art, such as the European modernists he saw at Alfred Stieglitz's "291" gallery and works by the Ashcan School. However, with a few exceptions, he was not yet able to integrate these trends into his own work. The art classes he sporadically attended, including stints at the National Academy of Design and the Art Students League, were of little apparent benefit to him. When he enrolled in the Ferrer School in the autumn of 1912, he began a period of intense and rapid artistic development. Man Ray abandoned conventional painting to involve himself with Dada, a radical anti-art movement. He published two Dadaist periodicals, that each only had one issue, The Ridgefield Gazook (1915) and TNT (1919), the latter co-edited by Adolph Wolff and Mitchell Dawson. He started making objects and developed unique mechanical and photographic methods of making images. For the 1918 version of Rope Dancer, he combined a spray-gun technique with a pen drawing. Like Duchamp, he did readymades—ordinary objects that are selected and modified. His Gift readymade (1921) is a flatiron with metal tacks attached to the bottom, and Enigma of Isidore Ducasse is an unseen object (a sewing machine) wrapped in cloth and tied with cord. Aerograph (1919), another work from this period, was done with airbrush on glass. In 1920, Man Ray helped Duchamp make the Rotary Glass Plates, one of the earliest examples of kinetic art. It was composed of glass plates turned by a motor. That same year, Man Ray, Katherine Dreier, and Duchamp founded the Société Anonyme, an itinerant collection that was the first museum of modern art in the U.S. In 1941 the collection was donated to Yale University Art Gallery. Man Ray teamed up with Duchamp to publish one issue of New York Dada in 1920. For Man Ray, Dada's experimentation was no match for the wild and chaotic streets of New York. He wrote that "Dada cannot live in New York. All New York is dada, and will not tolerate a rival." In July 1921, Man Ray went to live and work in Paris, France. He soon settled in the Montparnasse quarter favored by many artists. Shortly after arriving in Paris, he met and fell in love with Kiki de Montparnasse (Alice Prin), an artists' model and celebrated character in Paris bohemian circles. Kiki was Man Ray's companion for most of the 1920s. She became the subject of some of his most famous photographic images and starred in his experimental films, Le Retour à la Raison and L'Étoile de mer. In 1929, he began a love affair with the Surrealist photographer Lee Miller. Miller left him in 1932. With Lee Miller, his photographic assistant and lover, Man Ray reinvented the photographic technique of solarization. 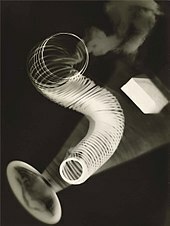 He also created a type of photogram he called "rayographs", which he described as "pure dadaism". Man Ray was in a relationship with the model Adrienne Fidelin during some time between 1936 and 1940, the two parting ways after Ray fled the Nazi occupation in France, while Adrienne chose to stay behind to care for her family. 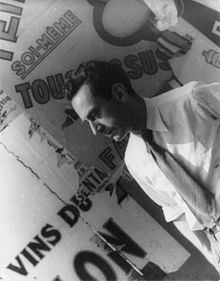 Man Ray was forced to return from Paris to the United States due to the Second World War. He lived in Los Angeles from 1940 to 1951 where he focused his creative energy on painting. A few days after arriving in Los Angeles, Man Ray met Juliet Browner, a first-generation American of Romanian-Jewish lineage. She was a trained dancer, who studied dance with Martha Graham, and an experienced artists' model. The two married in 1946 in a double wedding with their friends Max Ernst and Dorothea Tanning. In 1948 Man Ray had a solo exhibition at the Copley Galleries in Beverly Hills, which brought together a wide array of work and featured his newly painted canvases of the Shakespearean Equations series. Man Ray returned to Paris in 1951, and settled with Juliet into a studio at 2 bis rue Ferou near the Luxembourg Gardens in St. Germain des Pres, where he continued his creative practice across mediums. During the last quarter century of his life, he returned to a number of his iconic earlier works, recreating them in new form. He also directed the production of limited-edition replicas of several of his objects, working first with Marcel Zerbib and later Arturo Schwarz. He died in Paris on November 18, 1976, from a lung infection. He was interred in the Cimetière du Montparnasse in Paris. Ray's epitaph reads "unconcerned, but not indifferent". When Juliet Browner died in 1991, she was interred in the same tomb. Her epitaph reads "together again". Juliet organized a trust for his work and donated much of his work to museums. Her plans to restore the studio as a public museum proved too expensive; such was the structure's disrepair. Most of the contents were stored at the Pompidou Center. In 1974, Man Ray received the Royal Photographic Society's Progress Medal and Honorary Fellowship "in recognition of any invention, research, publication or other contribution which has resulted in an important advance in the scientific or technological development of photography or imaging in the widest sense." In 1999, ARTnews magazine named Man Ray one of the 25 most influential artists of the 20th century. The publication cited his groundbreaking photography, "his explorations of film, painting, sculpture, collage, assemblage and prototypes of what would eventually be called performance art and conceptual art." ARTnews further stated that "Man Ray offered artists in all media an example of a creative intelligence that, in its 'pursuit of pleasure and liberty', unlocked every door it came to and walked freely where it would." Seeking pleasure and liberty was one of Ray's guiding principles, along with others such as doing things that are socially prohibited. In March 2013, Man Ray's photograph Noire et Blanche (1926) was featured in the United States Postal Service's "Modern Art in America" series of stamps. On 9 November 2017 Man Ray's Noire et Blanche (1926), formerly in the collection of Jacques Doucet, was purchased at Christie's Paris for 2.6 million euros, becoming the 14th most expensive photograph to ever sell at auction. On 13 November 2017, an assemblage by Man Ray titled Catherine Barometer (1920), sold for $3,252,500 USD at Christie's in New York. "It has never been my object to record my dreams, just the determination to realize them." – Julien Levy exhibition catalog, April 1945. "There is no progress in art, any more than there is progress in making love. There are simply different ways of doing it." – 1948 essay, "To Be Continued, Unnoticed". "An original is a creation motivated by desire. Any reproduction of an original is motivated by necessity. It is marvelous that we are the only species that creates gratuitous forms. To create is divine, to reproduce is human." – "Originals Graphic Multiples", circa 1968; published in Objets de Mon Affection, 1983. "I paint what cannot be photographed, that which comes from the imagination or from dreams, or from an unconscious drive. I photograph the things that I do not wish to paint, the things which already have an existence." – Undated interview, circa 1970s; published in Man Ray: Photographer, 1981. "With him you could try anything—there was nothing you were told not to do, except spill the chemicals. With Man Ray, you were free to do what your imagination conjured, and that kind of encouragement was wonderful." – Artist and photographer, Naomi Savage, Man Ray's niece and protégée, in a 2000 newspaper interview. "Man Ray is a youthful alchemist forever in quest of the painter's philosopher's stone. May he never find it, as that would bring an end to his experimentations which are the very condition of living art expression." – Adolf Wolff, "Art Notes", International 8, no. 1 (January 1914), p. 21. "[Man Ray was] a kind of short man who looked a little like Mister Peepers, spoke slowly with a slight Brooklynese accent, and talked so you could never tell when he was kidding." – Brother-in-law Joseph Browner on his first impression of the artist; quoted in the Fresno Bee, August 26, 1990. Man Ray (1926). Revolving doors, 1916–1917: 10 planches. Paris: Éditions Surrealistes. Man Ray (1934). Man Ray: photographs, 1920–1934, Paris. Hartford, Connecticut: James Thrall Soby. 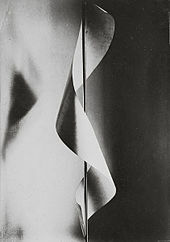 ^ "Rayograms by Man Ray". Time. April 18, 1932. Retrieved January 6, 2012. ^ a b c d Herschthal, Eric (November 10, 2009), "Man Ray's Jewish Identity: 'Concealing And Revealing'", The Jewish Week, archived from the original on January 27, 2010, Klein suggests that Ray may have even been the first Jewish avant-garde artist, though it is a tenuous claim given both the movement and Man Ray's disavowal of ethnic identity. ^ "The Collection | Man Ray. The Rope Dancer Accompanies Herself with Her Shadows. 1916". MoMA. Retrieved January 6, 2012. ^ Staff. "Man Ray Is Dead in Paris at 86; Dadaist Painter and Photographer", The New York Times, November 19, 1976. Retrieved December 15, 2013. "His style changed in 1915 to 'reducing human figures to flat-patterned disarticulated forms.' He was living at the time in Ridgefield, N. J." ^ Husar, Emma (2017). In the Spirit of Dada Man Ray, The Ridgefield Gazook, and TNT (Honors). University of Iowa. Retrieved January 7, 2019. ^ "Inventory of the Mitchell Dawson Papers, 1810-1988". The Newberry. Retrieved January 7, 2019. ^ "IMAGINE – The Israel Museum's searchable collections database". Imj.org.il. Retrieved January 6, 2012. 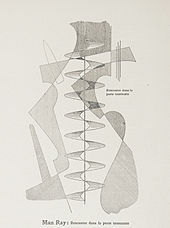 ^ "Man Ray, Aerograph, 1919, Stedelijk Museum, Amsterdam". Archived from the original on June 18, 2015. Retrieved June 18, 2015. ^ a b c "Man Ray – Prophet of the Avant-Garde | American Masters". PBS. September 17, 2005. Retrieved January 6, 2012. ^ "Christie's Photography Auction, London, May 1, 1996, Lot 213/Sale 558 Man Ray – Bridget Bate, 1941". Christies.com. Retrieved January 6, 2012. ^ a b Flint, Peter B. (January 21, 1991). "Juliet Man Ray, 79, The Artist's Model And Muse, Is Dead". The New York Times. Retrieved December 3, 2014. ^ Ray, Man (1999). Self Portrait: Man Ray (First paperback ed.). Bulfinch. ISBN 0-8212-2474-3. ^ Wilson, Scott. Resting Places: The Burial Sites of More Than 14,000 Famous Persons, 3d ed. : 2 (Kindle Locations 38837-38838). McFarland & Company, Inc., Publishers. Kindle Edition. ^ "Progress Medal". Royal Photographic Society. 1974. Retrieved December 2, 2017. ^ Ray, Man (1998). "Plates". In Weston Naef (ed.). Man Ray: Photographs from the J. Paul Getty Museum (Print book) (2nd ed.). Los Angeles: Christopher Hudson. p. 14. ISBN 0-89236-511-0. Retrieved April 24, 2012. ^ Bari, Martha Ann; Bonnell, Letty (2009). Man Ray, African Art, and the Modernist Lens. International Arts & Artists. p. 148. ISBN 9780816670178. Retrieved August 25, 2018. Allan, Kenneth R. "Metamorphosis in 391: A Cryptographic Collaboration by Francis Picabia, Man Ray, and Erik Satie" in Art History 34, No. 1 (February 2011): 102–125. Foresta, Merry, et al. Perpetual Motif: The Art of Man Ray. Washington: National Museum of American Art; New York: Abbeville Press, 1988. Grossman, Wendy A., Adina Kamien-Kazhdan, Edouard Sebline, and Andrew Strauss. Man Ray—Human Equations: A Journey From Mathematics to Shakespeare ; Hatje Cantz; ISBN 978-3775739207 (2015). Klein, Mason. Alias Man Ray: The Art of Reinvention ; Yale University Press; ISBN 978-0300146837 (2009). Knowles, Kim, A Cinematic Artist: The Films of Man Ray. Bern; Oxford: Peter Lang; ISBN 9783039118847 (2009). Mileaf, Janine. "Between You and Me: Man Ray's Object to be Destroyed," Art Journal 63, No. 1 (Spring 2004): 4–23. 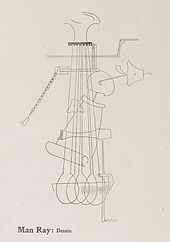 Wikimedia Commons has media related to Man Ray.